Books make great gifts, and are especially welcome in winter to while away the long, dark evenings. Here are some of the outdoor themed and other books I’ve enjoyed this year. Links are to various websites, including Amazon. A Taste For The Woods is not sponsored in any way by publishers or retailers, and all books mentioned in this article were purchased or received as a gift. Emma Gatewood was both a landmark and a footnote in the history of the outdoors until 2014, when Grandma Gatewood’s Walk was published. 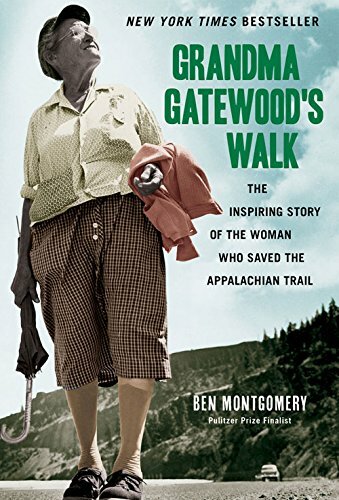 The first full length biography of the first female Appalachian Trail through hiker presents Gatewood as a bold woman with a fascinating history behind her exploits. I love it when a historian takes a flat record and gives us a living, breathing person, and author has done just that. Of all the books on this list, Grandma Gatewood’s Walk is not only the best, but the most important. Another woman, Cindy Ross, also gets around. Unlike Gatewood she also writes about it. I’ve known about her travel and outdoor writing in Pennsylvania Magazine for years, but the full range of her outdoor experiences was unknown to me until recently. Unfortunately many of her books are out of print. One that isn’t is Journey on the Crest, detailing her hike on the Pacific Coast Trail. Fortunately its a fine account of a long distance hike, and if Ross wrote nothing else she would be a great writer. Hiking guides often seem to repeat the same hikes from book to book. Alan Via avoids that problem in The Catskill 67 by focusing on peaks in the Catskill 100 but not among the 35 mountains over 3500 feet. The instructions are detailed, the photography is beautiful, and the writing richly anecdotal. Scott Brown has written a few books on hiking and photography in Pennsylvania and New York, and now Hiking Maryland joins the list. Brown’s books are “for photographers” and include detailed suggestions on when to hike for the best light and most interesting photos. And while popular hikes show up in his book, he also covers off the beaten path places. And, of course, the photography is amazing. Two decades ago Death in Yellowstone spawned a genre of books about bad ends in national parks, and now there’s an updated edition including more mayhem and mishap. The book also corrects and adds to its previous history of America’s oldest national park. And its not all death; there are some stories of survival, and some grim humor – the chapter on bear attacks describes a lawsuit that, if it succeeded, might have required the National Park Service to radio tag all the bears in the park. Finally a book that isn’t about the outdoors, but I find helpful and thus relates to it for me. I am a terribly unorganized person with horrible time management skills. This causes problems for me and restricts the amount of time I spend in the outdoors. (It also means I have three camp stoves because I keep misplacing them.) There are many books on organization, but Corie Clark’s The Simplicity Project is as good as any, and the author’s ideal for the reader is simplifying your life to get more out of it, not just help you get closet space. Although you probably will also get more closet space too. Readers, what books do you recommend as gifts this year? The comments are open for your suggestions.